In today’s world, occupational health and safety (OHS) in the workplace is paramount. Workplace injuries cost the Australian economy more than $60 billion each year, making OHS a top priority for the Australian Government and Australian businesses alike. Whether you're regularly moving patients, heavy equipment, awkward loads, linen, food, or waste, there is simply no safe way to manually push, pull, or carry heavy loads. If your company’s work practices still involve manual push, pull, or carry tasks, you are sitting on a time bomb. With an ageing workforce and increasing WorkCover and WorkSafe insurance premiums, managers of unsafe workplaces are being punished with fines and even jail time. To continue to do business now, you need to eliminate unsafe manual materials handling practices in your workplace. Electrodrive can help you, and your staff, stay safe by providing solutions that eliminate manual materials handling from your workplace. 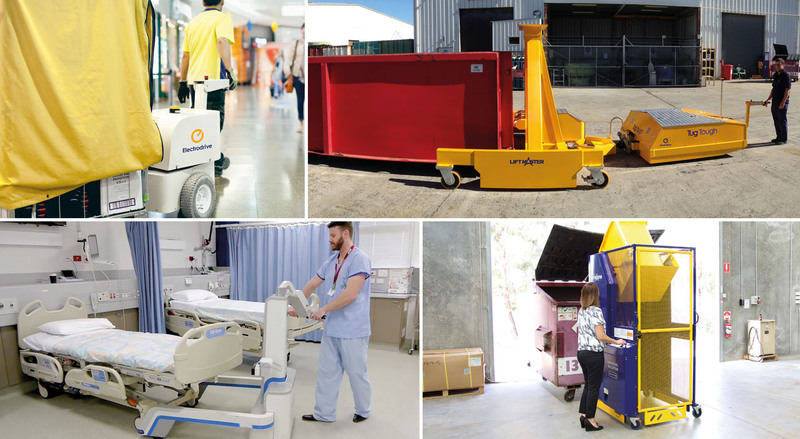 With our range of Powered Tugs, Linen Movers, Powered Trolleys, Bed Movers for patient transport, and Bin Lifters and Waste Bin Movers for waste management, a single operator can move heavy loads safely, minimising the risk of back or shoulder strains. Furthermore, as a solutions provider, Electrodrive can design and build everything to suit your particular workplace. This means that you, and your staff can do more with less—more productivity, less risk to injury. Electrodrive materials handling equipment are recommended and trusted by OHS inspectors and companies alike. Once you’ve seen what we can do for your workplace, we are sure that you will too. Electrodrive is a member of the Fallshaw Group.